Guys, herewith some brief information about history of light prepared by some friends at Q-Ray LED Lighting. As technologies evolves the light become more green (i mean, not the light is green in color. It’s more likely going with less and less carbon foot prints). Architecturally and thematically designed in the shape of a drop of water, the Water Building Resort intends to become the first building ever to convert air into water with the help of solar power. What sounds like magic will be achieved with the following combination of nature and technology: A sunny, southerly facing facade made of photovoltaic glass will harness solar energy, allowing light to pass through. The northern facade features a latticed design for ventilation as well as unprecedented Teex Micron equipment that will convert humid air and condensation into pure drinking water. 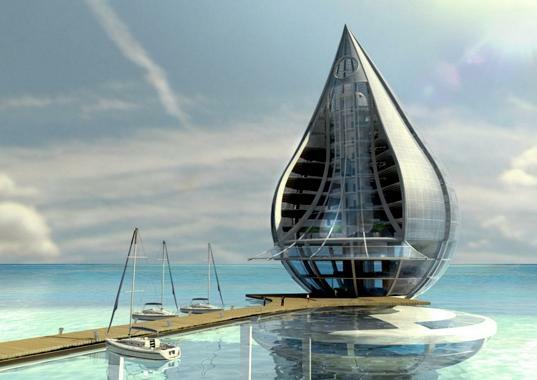 Designed for construction in warm and humid coasts, the Water Building Resort, a resort complex, will also house a water treatment facility in the bottom floor, for purifying salty sea and rain water, along with a center of technological investigation to control and certify water quality. Restaurants, gyms, exhibition halls, hotel and conference rooms, and spa services will fill the upper floors – all based on the theme of water, the environment and renewable energy. An underwater aquarium will sit at the base of the Water Building Resort, rounding out the water conscious theme and practices. While the air in Beijing, and efforts to improve it, have been a concern for the Olympic organizers and competitors, they could prove a boon for researchers. Beginning tomorrow, a UC-San Diego professor will be sending unmanned aerial vehicles into the pollution clouds emanating from the city to measure the impacts of the government’s industrial shutdowns and traffic bans on the region surrounding Beijing. “We have a huge and unprecedented opportunity to observe a large reduction in everyday emissions from a region that’s very industrially active,” said atmospheric scientist V. Ram Ramanathan, who also works with the Scripps Oceanographic Institution.